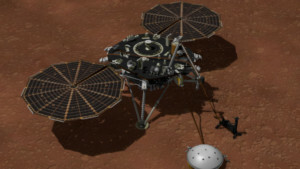 Three days ago, a NASA probe, called InSight, landed on Mars. This is the 8th time that NASA has successfully landed on Mars and it’s no small feet. InSight traveled more than 3 million miles. It entered the Martian atmosphere traveling at 12,300 mph. Over the next 6½ minutes it was slowed down to 5 mph just before a flawless touchdown. InSight will spend the next 2 years exploring Mars. Here’s a link to the NASA page where you can follow along every step of the way.